An international group of women journalists urged the Association of Southeast Asian Nations (ASEAN) on Thursday (Nov 9) to uphold media freedom and halt attacks, including those initiated by state proxies. The International Association of Women in Radio and Television (IAWRT) singled out the Philippine experience in online harassment of women media professionals at the launch of a safety handbook for women journalists in war and conflict. Online media women are subject to attacks at three times the rate of their male colleagues, the IAWRT said. “That is especially true in the Philippines, host of the 31st ASEAN Summit,” said IAWRT President Gunilla Ivarsson. It cited fieldwork by guidebook author and veteran Egyptian journalist Abeer Saady, and a study by the International Women’s Media Foundation and The International News Safety Institute. The organization noted the online attacks against several Filipino women journalists covering conflict situations and President Rodrigo Duterte’s bloody crackdown on narcotics networks. At least three of media workers and several citizen journalists faced threats of sexual assault, said Ronalyn Olea, editor of the digital news website Bulatlat.com and treasurer of the IAWRT’s Philippine chapter. Olea said the Philippines experience is not unique, though there is a higher level of sophistication in online assaults and the state’s use of proxies. “The attackers and the leaders are not ordinary online users but are paid by governments,” she pointed out. “In other countries like Myanmar, Thailand and Indonesia, the direct violators of press freedom are state agencies,” she added. IAWRT also condemned the killing of an Indian editor by suspected right-wing Hindu extremists and the government pressure that forced the Cambodian Daily to stop publication. In Myanmar and Thailand, draconian laws have led to the arrests of journalists, the group added. "We are calling on the ASEAN heads of state to uphold media freedom and stop the attacks on our colleagues. These are not random acts of violence. They are more often than not political persecution,” Ivarsson said. Since the ouster of the late dictator Ferdinand Marcos in 1986, 178 journalists have died in the Philippines, 12 of them women. Ivarson pointed out that five journalists have died since President Rodrigo Duterte assumed power in 2016. Saady said local journalists and citizen journalists are especially vulnerable to attacks. “The conflicts and wars happen in their hometowns, involving people they might know,” she said. Saady said a second installment of the guidebook could focus on Philippine cases and best practices by journalist organizations. UNESCO Director-General Irina Bokova has pointed out that female journalists face “a double attack” violence as they are targeted as women and as a professional journalists. The scale of the problem prompted the United Nations Security Council to pass Resolution 2222 on May 27, 2015 to draw attention to the specific risks faced by women in media. 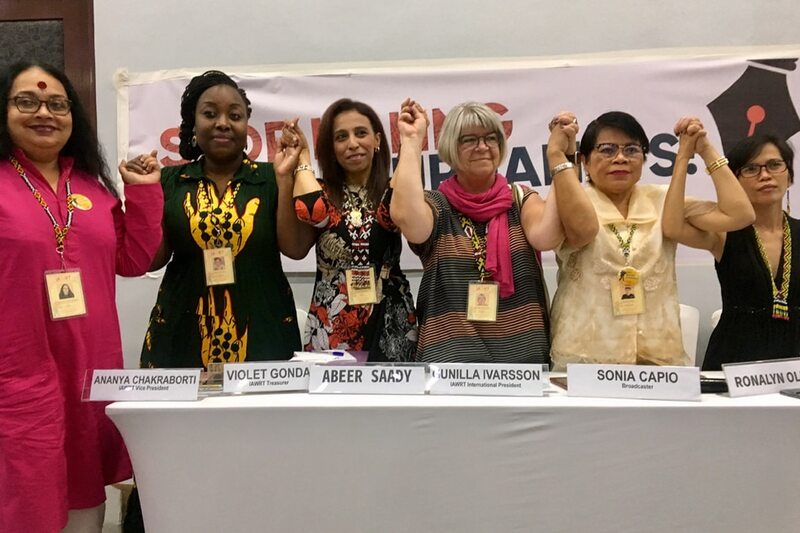 Ananya Chakraborti, IAWRT vice president, said many cultures in the developing world still struggle with the reality of women taking on roles once reserved for men. “There is a strong desire, especially by men in power, to punish women for talking and the message is, ‘shut up, go back home’,” Chakraborti said. The guidebook also acknowledges the vast difference in financial and logistics capacity, and status enjoyed by women journalists. In conflict zones, where warring parties also target the general women population, journalists are easily demonized. 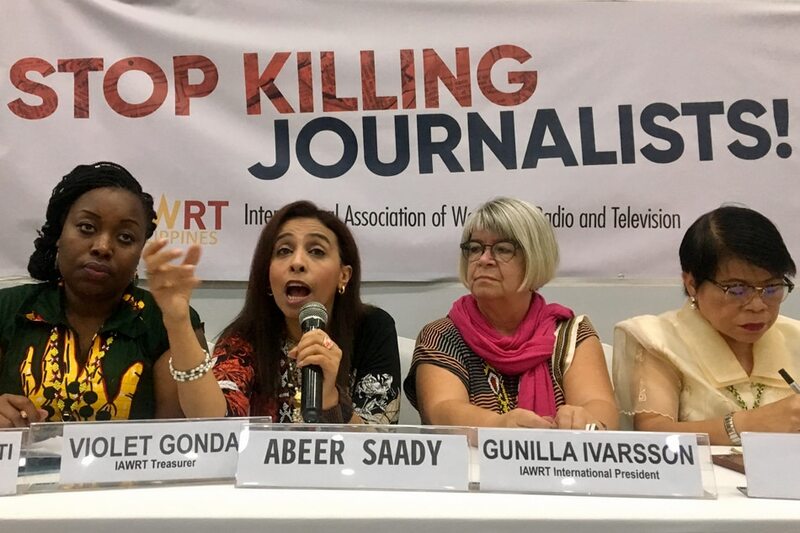 “I believe the message of killing or hurting women journalists os to demonize the presence of women in wars and military or civil conflict,” said Saady. The attacks, she said, send a message to all women, particularly strong local women – to stay home.